The gardens are a big draw for visitors to the Cloisters, but I strongly recommend a visit to this branch of the Metropolitan Museum of Art in winter, particularly right after a snowstorm. Though you are definitely still in Manhattan, the Cloisters feels like a trip to medieval France or Italy. Snow often keeps away big crowds and the peace and solitude of the museum are unmatched anywhere in New York City. The Cloisters was built between 1934 and 1938, While the building as a whole is modern, it incorporates pieces of late medieval structures including an apse from Spain and five ensembles of cloister capitals and columns from France. Medieval doorways, windows, and stone fragments are found in every gallery. It is an immersive experience where the collection of late medieval art is displayed in a context that suggests its original display or function. Even without looking too closely at the collection, a visit to the Cloisters is a dreamy, almost meditative journey. The experience begins as you step off the subway. Take the A train to 190th Street and be sure to exit via the elevators to Fort Washington Avenue. (If you exit at street level and find yourself on Bennett Avenue, just go back to the station and take the elevators, no need to swipe your MetroCard again.) Once outside, you can wait for the M4 bus which will drive you through Fort Tryon Park, or you can walk. Fort Tryon Park, once the site of a revolutionary war battle, is composed of hills, paths, and plateaus for looking. From the subway, enter the park via Margaret Corbin Circle. The first sight you will see is the Heather Gardens which are spectacular year-round. On a snowy day, there will be lots of local families out sledding and walk their dogs. You will also pass the New Leaf Cafe, a farm-to-table restaurant where you can stop for coffee, pastries or lunch. As you walk through the park, gaze upon the Hudson River where the only building you will see is St. Peter's College. In 1933 John D. Rockefeller, Jr purchased over 700 acres on the Palisades Cliffs in order to preserve the view from the Cloisters. A straight walk to the Cloisters via the main road (follow the bike path) takes about seven minutes. A long walk through the park's paths can take 20-30 minutes. Take your time and enjoy it. Inside the museum, the hub of the collection is the Cuxa cloister, a series of capitals carved in the 12th century for the monastery of San-Michel-de-Cuxa. From November through March, glass encloses the arcades from the garden, which creates the effect of gazing into a giant snow globe. The arcades are filled with potted plants that were known and cultivated in the Middle Ages. Sit at one of the benches near the heat grates and warm your back in the peaceful solitude of the cloister. The galleries are usually very quiet on snowy days which will allow you long looks at the best treasures. And there are some tremendously important works you must not miss. The Unicorn Tapestries: Woven around 1500, these wool, silk and gilt tapestries contain a narrative of a unicorn hunt. The Merode Altarpiece: a private devotional altarpiece made for a private home in the 1420s, this painting is the most famous work of the Northern Renaissance. In the center panel, the Archangel Gabriel brings news to the Virgin Mary who appears reading in her posh medieval townhouse. While the Holy Spirit is shown descending on her by the freshly extinguished candle, the tiny infant soul of Christ flies straight through an unbroken window, holding a cross, cruising right toward the Virgin's womb. Close looking at this extraordinary painting is endlessly rewarded. The Belles Heures of Jean duc de Berry: Located on the lower level in the Treasury, the page on display in this extremely famous and important manuscript is periodically changed. 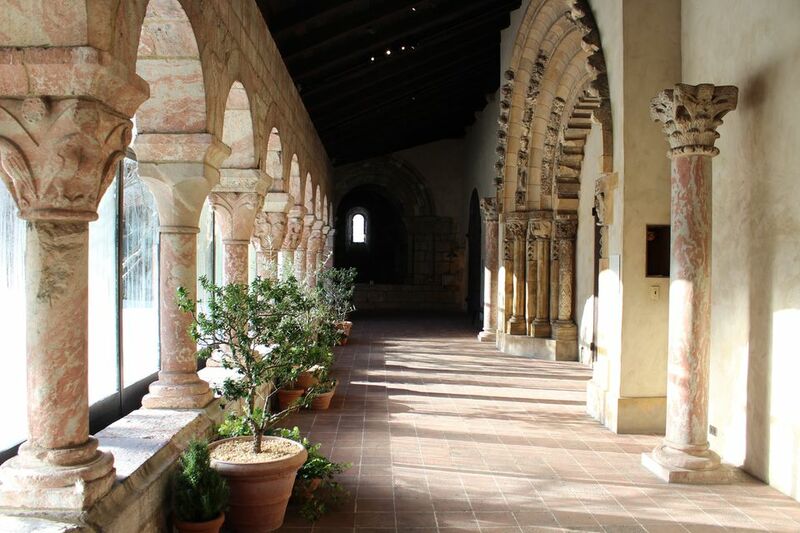 The Cloisters is a small museum and it's possible to see the entire collection in two hours. Whether you take a guided tour, listen to the Audioguide or simply wander, the experience of the museum will quiet your mind and transport you to another time.